Sun Sep 30: SWC / 61 Cavalry team narrowly beat the Sahgal Stud / RPC team in an exciting match to win the Army Commander's Cup (8 goal) in Jaipur. 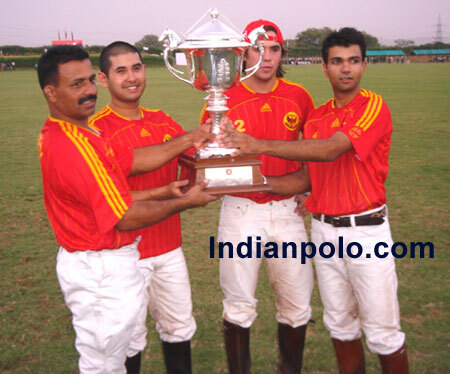 The final of the Army Commander's Cup was played on Sunday Sep 30 at the Cavalry Polo Ground in Jaipur. This game was played on the beautiful ground no 1 of the 3 polo grounds at 61 Cavalry. The Chief Guest for the event was Lt Gen PK Singh, AVSM, GOC-IN-C, South Western Command. There was not an empty seat to be found in any of the stands. Due to the difference in handicap Sahgal Stud/RPC started with 1-1/2 goals. However the SWC/61Cav team did not waste any time and scored 3 goals in the 1st chukkar to 1 by Sahgal Stud/RPC. At the end of the 1st chukkar the score was 3-2.5 in favour of the SWC/61 Cav team. In the second chukkar SWC/61 Cav increased their lead 5-3.5. In the 3rd ckukkar the Sahgal Stud/RPC managed to catch up and take the lead at the end of chukkar 3 (6.5 - 6). The last chukkar was a fast chukkar. Both teams wanted to win the trophy. However, at the end of the final chukkar it was SWC/61 Cav who prevailed, narrowly defeating the Sahgal Stub/RPC team by 1/2 goal. Final score was 8 - 7.5. The star of the match was Siatiago Cernada +5 player from Argentina, who seemed like he was playing hockey on horseback. His tremendous ball control won the applause of the crowd several times. He received strong support from his team mates Capt HH Ismail Ibrahim, and Capt Vishal Chauhan. For the Sahgal Stud/RPC team Vishal Singh and Lokendra Singh (Loku), with support from Gaural Sahgal and Tarun Bilal tried hard to prevent the aggression of Santiago. They did suceed towards the end but fell short by a goal at the end.